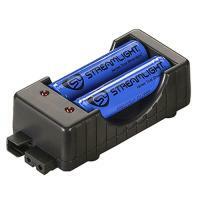 Keep batteries charged and lights on with the 18650 Battery Charger from Streamlight. The twin cradle can hold two batteries and charge them singularly, or both at the same time. An internal power safety circuit prevents overcharging and dangerous overheating. A dual power input accepts 5V micro-USBs, as well as traditional AC and 12V DC power sources. The cradle is compatible with 18650 lithium-ion batteries. Its reinforced plastic construction has the strength to withstand the duress of regular use. A high powered energy regulator provides lightning fast charges in as little as three hours.